A new report from the Congressional Research Service points out that in terms of total hydrocarbon resource, the US possesses the largest inventory of any nation on Earth. But under the Obama regime, an unstated but unrelenting program of "energy starvation" is being carried out -- from the DOE to the Department of Interior to the EPA, even including the NRC. It is one thing to be energy-poor because you lack the resources. It is quite another to intentionally cripple your own economy using half-baked policies of carbon hysteria, nuclear fear, and faux environmental crisis fabrication. America’s combined energy resources are, according to a new report from the Congressional Research Service (CSR), the largest on earth. They eclipse Saudi Arabia (3rd), China (4th) and Canada (6th) combined – and that’s without including America’s shale oil deposits and, in the future, the potentially astronomic impact of methane hydrates. ...if the White House is in any way serious about impacting the economic Black Hole that is the burgeoning national debt, reinvigorating business big-time, creating real jobs and restoring ebbing national wealth, the best shot by a distance if you’re American ... well, you’re standing on it, or rather above it. 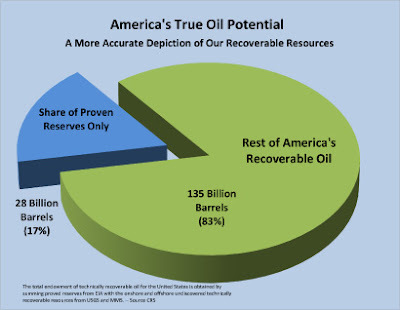 ...While the US is often depicted as having only a tiny minority of the world’s oil reserves at around 28 billion barrels (based on the somewhat misleading figure of ‘proven reserves’) according to the CRS in reality it has around 163 billion barrels. As Inhofe’s EPW press release comments, “That’s enough oil to maintain America’s current rates of production and replace imports from the Persian Gulf for more than 50 years”. Next up, there’s coal. The CRS report reveals America’s reserves of coal are unsurpassed, accounting for over 28 percent of the world’s coal. Much of it is high quality too. 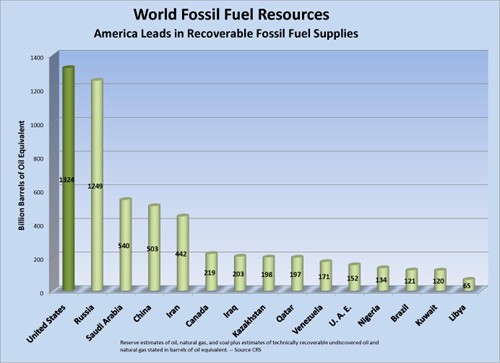 The CRS estimates US recoverable coal reserves at around 262 billion tons (not including further massive, difficult to access, Alaskan reserves). Given the US consumes around 1.2 billion tons a year, that’s a couple of centuries of coal use, at least.